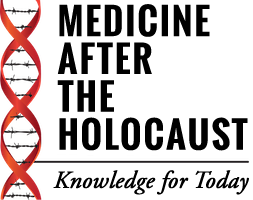 The mission of the Center for Medicine after the Holocaust (CMATH) is to challenge doctors, nurses, and bioscientists to personally confront the medical ethics of the Holocaust and to apply that knowledge to contemporary practice and research. Why Teach “Medicine After the Holocaust”? View clips from speakers on relevant topics and learn how the doctor-patient relationship has changed since the Holocaust. Find out the latest news and hot-button topics affecting the medical community and medical ethics right now. "Our 'Champions' are faculty members in schools of medicine, nursing, public health, and other health sciences who study, teach, and research about medicine and the Holocaust." 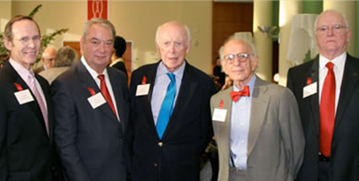 Sheldon Rubenfeld, CMATH President, with Nobel Laureates Ferid Murad, James Watson and Eric Kandel, and Walter Hecht, President of Holocaust Museum Houston at the opening lectures of the Michael DeBakey Medical Ethics Lecture Series. Join the discussion about medical ethics. Join our Facebook group to post questions, participate in discussions, and share relevant research, articles, and your views on medical ethics. The page is private, so once you gain access, all your posts will be secure and only accessible by other valued members of the CMATH community.